Not long ago, while riding the commuter train home, I sat down on an upper row seat not far from a young Indian woman. Her head was covered so I believed her to be a devoutly religious person. 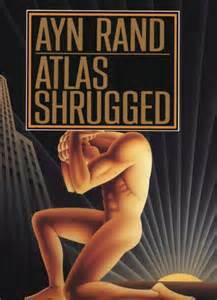 On her lap was Ayn Rand’s “Atlas Shrugged”. I wondered what interested her in Rand’s lengthy novel. As you know there has been much in the media-the politically biased-media-about corporate greed, fairness and income inequality. The “social justice “rhetoric is ubiquitous, whether here in the U.S. or in re-salvaged unrepentant Greece. In op-eds and news commentaries we are lectured to with the by-products of the liberal elites (e.g., Paul Krugman (see my previous post about economist Krugman’s $225K payday in return for his thoughts on Income Inequality! ), by Progressive politicians (e.g., Hillary Clinton and Liz Warren) and by their media puppets (e.g., MSNBC), all of whom feign a disdain for money, that “filthy lucre”, while quietly reaping enormous capital gains of their own (See also Vanity Fair’s glossy wealth-guilt sympathy card dated August 2015, the article “The Charlie War”, regarding the French satirical weekly magazine Charlie Hebdo coming into mega-Euros.) Looking out for number one has never been so savoir faire. Then not long ago we were accosted by the “commoners” – the OWS protesters. Though largely unfocused and self-trivializing we were told by our ‘betters’ that these poor folk just wanted to generate a discussion about what is ethically the “right thing to do” in the world of money and specifically money as a power or a force to use for “good” and not for selfish materialistic pleasure (ahem, Vanity Fair). The Wall Street bulls and bears became the effigies they wanted to burn or, rather, smoke to get their solvency high. The OWS’ trashy 60’s bohemian style protest became a mixed message diatribe against a ‘rigged” system, a system that didn’t appear (in their cloud computing at least) to offer them a break into the big leagues of the adult material world. 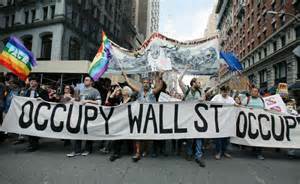 Apparently, the OWS protestors ‘just’ wanted to “survive” materially, debt-free, well-off and on their own terms-no pain, all gain, Greek style. It was noted though by those standing head and shoulders (a stock chart term) above the “Leaning Forward” genuflectors that the protestors was certainly compromised in their messaging. Their signage/texting revealed the protesters demands. Their demands included gaining “justly” (a word replacement for “freely”) the same materialistic “well-being” that someone else had achieved under the rubrics “income equality” and “free tuition” and “social justice”. Their socialist mantras were remarkably self-centered, covetous and Marxist. Is the OWS’ ‘just’ quest for materialism-looking out for number one-any different from the Wall Street gang “running with the bulls” down Wall Street in hopes of not being gored by unleashed regulators? And, rigged or not rigged, Materialism, in the light of day, wears the same “envy green” scrubs. Unions are all about looking out for Number One. A union representing government employees on Tuesday condemned a bill meant to reform how bonuses are awarded at the Department of Veterans Affairs. “It’s time to turn the page on morale-busting measures like Rep. Miller’s proposal and focus on the mission of delivering top-quality care to America’s veterans,” AFGE President J. David Cox Sr. declared in a statement. A Koch Brothers-funded front group called the Concerned Veterans for America (CVA) has been making waves on Capitol Hill lately, promoting a long list of anti-VA, anti-worker proposals that would break this sacred promise and leave veterans out to dry. Led by former Wall Street bank employee and failed Senate candidate Pete Hegseth, CVA has been the driving force behind efforts to dismantle the VA health care system and trim service members’ hard-earned disability and other benefits. Yeah, those evil Koch Brothers trying to help veterans by removing bad employees-not Number One on AFGE’s list. Why make the VA better for our wounded veterans when union members are more G_d-Damn important? Looking out for Number One leaves the robbed and wounded man left for dead alongside the road…until the Good Samaritan comes along to care for him. The recent abominable SCOTUS decision made it possible for homosexual couples to look out for their Number One mission-use their new-found legal licentiousness to bash Christians and to seek material gain via law suits against Christian wedding cake bakers who refuse their demands. All done under the guise of ‘true love’ and “equality” (actually, unabated unnatural desires). Looking out for number one has never been so “User friendly” for lawyers and bullies. Ayn Rand’s (1905-1982) novels portray the philosophy of Objectivism. The (paper) weighty “Atlas Shrugged” and “The Fountainhead” clearly identify the key tenets of Objectivism: objective reality, reason, individualism over group-think, self-interest and ego-ism. There are four pillars to Rand’s objectivism: objective reality, reason, self-interest and capitalism. For Rand Man is all there is. There is no spiritual reality of angels, demons and God. The heroism of man was to be worshipped, as did the Greek stoic philosophers and the food-and-wine-friendly Epicureans who avoided God and enjoyed the ‘heroics’ of pleasure. Early Greek philosophers taught that man was mortal, corporal, and that sensory inputs were the only reality available to mankind. God was described as elsewhere and angry so therefore the true God was not of any material benefit to mankind. Avoid pain, seek pleasure. Be your own hero. Be Number One. Rand’s Self-interest: your own self-interest and happiness is what life is all about. You take care of Number One. Capitalism for the Objectivist is all about individual rights and private property; self-reliance, free trade, entrepreneurship and initiative all operate freely and without coercion within capitalism and the free market system. I have no issues with Rand’s objective definition of capitalism. As a Christian in the Kingdom of God I do have a problem with Rand’s use of capitalism as a means to flee from God and from responsibility towards others and to use it as self-promotion, as a prosperity gospel. 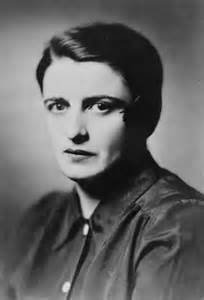 Ayn Rand’s described herself as a romantic-realist. Her Objectivism is atheistic, rejecting faith and religion. It believes only in reason and what the self can determine. For her it was every man for himself, the survival of the fittest. This viewpoint is born out of a godless Darwinian materialist view of life, the Enlightenment era and philosophical naturalism. Objectivism is blind faith in Number One-Yourself. The Kingdom of God’s answer to Looking Out for Number One: kenosis- a ‘self-emptying’ of one’s own will and becoming entirely receptive to God’s divine will. Before Ayn Rand another voice of philosophical naturalism had chosen the similar atheistic force with which to respond to “the law of life”: Jack London (1876 – 1916). 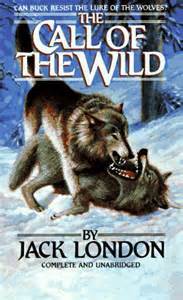 Remember Buck and the rugged ‘individual’s’ response to “The Call of the Wild”? It’s a tale of primitive and bestial survival, of self-interest, of the strong seeking to overcome nature. It’s a tale of reversion to innate instincts and characteristics of our evolutionary heritage-a looking out for Number One and a dog eat dog meal ticket.